A thumbnail review of Brave: a charming, utterly engaging little film that is probably not going to get the reviews and attention it deserves, because it’s mainly, you know, about girls and stuff. Pixar has done its best to disguise the whole girl-ness situation by placing weapons and fighting in almost every clip of the trailer that isn’t taken up with scenery shots, but basically, it’s an unfixable problem. Consistently, throughout this film, women have discussions that have nothing to do with any man. They talk about things like fate, and magic, and honor, and the power of storytelling, so right away you can see where their conversations are going to be irrelevant. The problem doesn’t stop there: the supposed heroine doesn’t even end up with a boyfriend, or any hint of one. What the heck is up with that? Even Mulan had a boyfriend, for pity’s sake. It’s almost like Pixar wants girls to get the message that they are actually complete individuals without a male attached. Good luck selling tickets with that. At the showing we attended yesterday, there were little girls clutching their Merida dolls, but no little boys in sight. It’s depressing, but statistically true, that girls will buy boy toys, but boys (or their parents) won’t buy girl toys. Because obviously, if the girl stuff was any good, it would be for boys. (Note to the under-10 crowd: this remains true when shopping for shoes in later life, too.) So I don’t predict huge commercial success for Brave, and there will probably be lots of reasons cited for its lackluster performance at the box office, but they will all mask the simple truth that the movie stinks of girl. It also stinks of too many cooks at the production table. I wonder if Pixar got increasingly nervous about a movie so heavily reliant on single-gender appeal, and began futzing with the recipe, because at times it was unclear if the movie inhabited 19th century England, or 5th century Germany, or what. Those gender roles were awfully confused. Was it a female-dominant society, or wasn’t it? Both could be true, depending on the time period in Scotland. 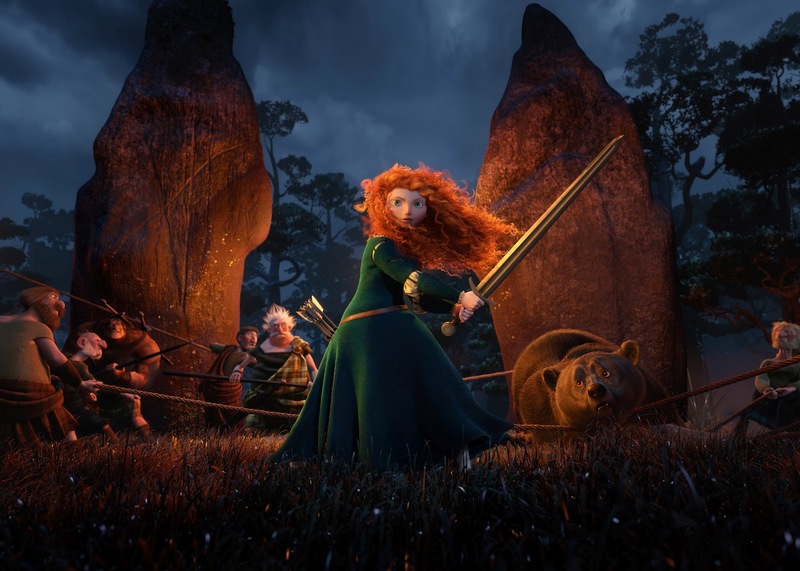 Was Merida the heir of the kingdom, or wasn’t she? Were we worrying about marrying her off respectably, or choosing her second-in-command as she ruled the kingdom herself? Her triplet brothers were the most obvious tell, and I’d lay good money they were thrown in at the last minute as a hopeful injection of boy. All they really managed to do was confuse the inheritance issue, and act annoying. I’d wager most boys are too smart to identify with indistinguishable characters whose only function is to annoy the big people, and run around squealing adorably like a collective Chihuahua. But narrative confusions aside, this is just a gut-punchingly gorgeous film, visually speaking. We ended up plunking down the money for the 3D because we didn’t want to wait another 50 minutes for a 2D showing, and for once the money was absolutely worth it. The attention to detail in this animation is almost painterly, and I found myself wanting shots to just freeze-frame an instant so I could drink it in. The highlands of Scotland may have been the most fully developed character in the movie, outside of Merida’s hair. And I don’t mean that disparagingly: that hair was beautifully rendered, moving like a live thing in every shot. As a redhead who has struggled her whole life to contain her unruly head of fuzz, I enjoyed Merida’s cosmetological abandon. So if you like cinematic beauty and strong female characters, go see this movie. It might just be the antidote to Magic Mike, Spiderman, Abraham Lincoln: Vampire Hunter, and (dare I say it) The Avengers.